EASTER PROMO: GoldFire City is fully decorated for the season and we have 6 exciting limited edition items! Get the details on how you can get yours before they are gone for good after May 2 by clicking on the egg icon at the top of the game screen. EASTER EGG HUNT 2019: It wouldn't be Easter without a massive Easter Egg Hunt! Click on the basket icon next to the promo icon to see the progress and get details on how to participate in this community-wide contest. Participants that reach their goal and the community goal will receive a limited edition Egg Hunt 2019 Trophy item! SLOTS UPDATE: We had hoped to have a new slot game ready for this update, but we are still putting on the finishing touches. A new slot game based on the poll results will be coming in the next update! FEATURE Lots without a casino can now be clicked on in the mini-map to see their name, address and who owns them. FEATURE The mobile apps for iOS and Android now support pinch-to-zoom so that you can zoom in to see details and zoom out to better see the world or the casino floors. This works on phones and tablets. UPDATE Made significant improvements to the rendering of the game to improve overall performance, especially on mobile (which should help with battery usage). We are seeing increases anywhere from 15-50% depending on the device being used. UPDATE Floors with VIP status disabled can now be moved to the first floor of a casino (VIP will remain disabled until they are no longer on the first floor). UPDATE Improved the consistency of XP award animations with double-XP to make it more clear (you always were awarded correctly, but sometimes it was confusing). UPDATE Profiles now show the name of lots that don't have a casino on them. UPDATE When on a chat ban, you are also blocked from buying table items for others. UPDATE Clicking to edit a lot from the phone while inside a building now walks your character outside before going to the lot editor instead of just giving an error. UPDATE There is now a confirmation popup when listing CP for sale. UPDATE When building a new casino, there is now an instant build option sort of like when buying items for your casino. This is only for a new casino and not upgrades. UPDATE Tweaked down the size of the mini-map on phones so that it didn't cover up so much of the screen. FIX Various bug fixes that could cause items to appear to have vanished after being placed on a floor/lot. FIX It was possible to sometimes end up with two of the same card in Solitaire. FIX Slot sprints would sometimes finish without showing who the winner was. FIX Crews would sometimes get matched for battle without having enough available players. FIX Players that didn't participate in the war now correctly see the war results on their crew page. FIX Server restarts could sometimes cause the poker screen to go black. FIX Selling condo items would sometimes appear to be worth nothing, though the server awarded the correct value. FIX Getting a blackjack at the same time as the dealer wouldn't correctly count towards mission progress. FIX The citizenship bonus no longer factors into the daily spin challenge in battles/wars. FIX Winning the daily spin jackpot now gives a score in the battle/war challenge. FIX Other players would sometimes appear invisible after traveling to a location (there may be multiple issues causing this, so let us know if you continue to see it). FIX Improved global chat handling on mobile. FIX You will now stop walking when opening the mini-map. FIX Several issues and improvements to the new player tutorial. We've reached quite the milestone today, one that most games never achieve. 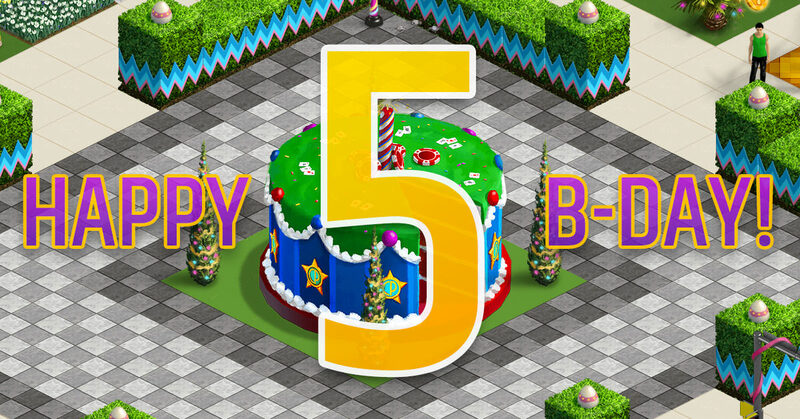 Five years ago today, CasinoRPG left beta testing! We've made lots of improvements, feature additions and new friends along the way. Whether you've been here from the start or just found our community yesterday, we are happy to have you as part of this amazing community. All of us on the GoldFire team have enjoyed getting to know all of you and we look forward to continuing to make this a great game and great community experience. MARDI GRAS PROMO: The city is decked out for the Mardi Gras festivities and we have 6 exciting limited edition items available! Get the details on how you can get yours before they are gone for good after March 19 by clicking on the Mardi Gras hat icon at the top of the game screen. BEAD COLLECTING 2019: Join up with the rest of the community and collect the most Mardi Gras beads from the casinos of GoldFire City! Click the beads icon next to the promo icon to see the progress and get details on how to participate in this community-wide contest. Participants that reach their goal and the community goal will receive a new limited edition trophy item! UPDATE Updated crew war date selection (which the server selects randomly) to not schedule a war that overlaps with double XP day. UPDATE Added option to withdraw from crew war while it is still pending. UPDATE Each raffle prize (poker, online, war) can now only be won by the same person once every 6 hours to give everyone a fair chance. UPDATE If the top item on a stack of party bomb items is one that you dropped, it would previously block collecting the one that is below it that someone else dropped. It now goes down the stack and collects the first one that you are able to collect. UPDATE Minor tweaks to scratcher odds to increase XP/CP payouts. FIX If a player sat at a Blackjack table while the dealer's cards were being dealt, a new hand would start instantly. FIX Another issue that could cause a poker tournament table to not start. FIX Various visual, scoring and other issues with crew wars. FIX Various issues with crew battles since the last update. FIX Possible fix for an issue that would randomly cause a phone app to get stuck on the screen. FIX Various issues and performance improvements on the new mini-map. FIX Various issues and tweaks with the new player tutorial. FIX Various issues that could cause server crashes, frozen poker tables, duplicated bombs and other random issues. FIX Waypoint paths could sometimes get stuck after doing a casino game mission. FIX Reordering of favorites wasn't always working correctly, especially with large numbers of favorites. VALENTINE'S DAY PROMO: The loving holiday of Valentine's Day is coming up on Thursday, February 14. For 24 hours only, a very limited edition slots item will be available for purchase (or until they sell out). We'll release a batch of 100 of the item every 2 hours throughout the day so every timezone gets a chance. These are on a first come, first serve basis with a limit of 5 per person, per batch. FEATURE We've been collecting all of your feedback on the crew wars and have created a new war experience that is a lot more fun and a lot more fair! The new system does away with teams (which means nobody has to be on the bench) in favor of an "all out war" system. The points/chips buy-in is now awarded at the end to the top 10% of individual players, similar to how payouts in a poker tournament work (it gets split between the players and their crew). Team challenges are now within your crew since there are no longer teams. Be sure to check the guide or open the "war info" button for all of the details. FEATURE There are two new trophy items available as part of crew wars. The first you win by placing in the top 10% and the other you win by completing your scorecard each day of the war (personal challenges and bonus challenges). FEATURE There is now a "war raffle" that awards free casino points to random online war participants all throughout the duration of the war. FEATURE Due to the war changes, we had to also make some changes to the crew rankings. The previous update was meant to simplify the rankings, but we didn't take it far enough. The rankings are now based on a simple accumulating score total (which means it can never drop). The values that make up this score are listed in the game guide so you can calculate exactly what you need to move up. FEATURE The monthly crew rankings have also been simplified to work like individual monthly rankings. They now reset at the start of each month and are simply a total of the score your crew has earned within each calendar month. FEATURE The mini-map has been overhauled to use an isometric view rather than a top-down view, so it now correctly matches the view of the world. This lets you see more in the same area and also makes it easier to navigate with everything aligned. FEATURE The real estate office's map has also been overhauled to now use the regular mini-map. This means that you can now view the entire city and buy any lot from any real estate building. FEATURE The real estate office's map now also includes a button to jump to the closest available lot from your current map location. UPDATE The "wars" stat in crew info has been replaced with "war winners" which shows how many members have placed in a war. UPDATE Tweaked the battle/war scoring on solitaire, blackjack and roulette to be more in-line with the other challenges. UPDATE Various updates and improvements to the Windows Store app (only on Windows 10). UPDATE When a casino is sold, any floors with VIP status will have their lists reset. UPDATE Added the keyboard shortcut "H" to get a hint while playing solitaire. UPDATE Overhauled the new player tutorials to better introduce new players to the various aspects of the game. FIX In rare instances, away players wouldn't get removed when they should from poker tournaments. FIX Issue that could sometimes cause a table in a poker tournament to not start. FIX The contract timer now starts when you first place the contractor rather than on purchase. This also fixes an issue that could cause contracts to get stuck on your head. FIX Using the "hint" option in solitaire could sometimes cause the game to freeze. FIX The Battle tab in crew windows would sometimes go blank randomly. FIX Instant upgrades on items would sometimes show a cost of 0 and a time of null when going in/out of the editor. FIX Indoor beam lights were not showing the option to replace when they were broken. FIX Various other bug fixes and tweaks throughout the game. FEATURE A new "lock party bombs" setting has been added to the game settings that prevents you from accidentally setting off party bombs with a mis-click. FEATURE Two new items have been added to Party Bombs and Daily Slots: B&W Slots and Purple Beam Light. FEATURE Previously, touch-screen users were unable to use local chat due to lack of keyboard. Now, you can click on yourself to reveal a chat button that will open the local chat input. UPDATE The time limits on buying lots/casinos have been overhauled to be applied evenly across all players. Instead of a time limit between each purchase, you are now limited to increasing your total number of lots/casinos by 5 each month. For example, if you were to sell 2 casinos, you could buy 7 others (net increase would then be 5 casinos for the month). UPDATE Limits on favorites have been increased from 50 to 100 and 100 to 250 for citizens. UPDATE There is now a 3rd time for the Turbo Trophy Fridays poker tournament that is at 12PM game time (first one will be scheduled after the next round of Friday tournaments). UPDATE The crew bank history now shows the time of last deposit overall and for the last week. FIX Floors that had thousands of items on them from party bombs would often cause significant performance degradation due to the limits of browser rendering. We've updated floors to now only render up to 3 items on a single floor tile at a time, which should significantly improve performance issues in those scenarios. The items are still there, they just won't become visible until others on that tile have been collected. FIX In rare instances, a casino could see its cheating costs shoot up significantly for a short period of time, which should now be resolved. FIX The winner of a slot sprint would sometimes not be shown, which would also prevent the re-invite option from showing. FIX Some crew's member lists couldn't be scrolled all the way through. FIX The notch on iPhone X, iPhone XS and iPhone XR running iOS 12 no longer covers up a portion of the game/toolbar. FIX Switching games with the "games" menu while in another game would cause you to get stuck in the first. FIX Depth sorting of some long items in the floor editor should now be fixed. UPDATE We've reached a point where there are so many casinos in the game world that the simulation server was crashing, causing various issues. We've overhauled how the simulation is run so that it can now scale to a nearly limitless number of casinos (we won't bore you with the technical aspects of how we managed this). UPDATE Submitted updates to both the iOS and Android apps that make several improvements and fixes (should be available in the next few days). The updates only support iOS 11+ and Android 5+ in order to provide a better app experience. UPDATE Overhauled the real estate fee structure to lower the fees in general and also make the difference based on location not as significant as it was before. UPDATE The item gifting limit per user has been changed to a daily limit rather than every 24 hours. FIX It was sometimes possible to end up with two buildings on the same lot. FIX The GoldFire toolbar on the mobile apps would sometimes get stuck in the middle of the screen. FIX Various keyboard issues on the mobile apps. FIX The auction house didn't adjust correctly to smaller screens. FIX Panning around a casino floor on a touch screen no longer accidentally triggers a casino game or other action. FIX A rare instance that could allow a crew with less than 3 members available to battle. FIX Various visual glitches and improvements. HOLIDAY PROMO: The city is decked out for the holiday season and we have 6 exciting limited edition items available! Get the details on how you can get yours before they are gone for good after January 4 by clicking on the snowflake icon at the top of the game screen. HOLIDAY GIFTING 2018: Santa needs your help delivering toys to all of the casinos of GoldFire City! Join up with the rest of the community and wear your best Santa suit for more efficient toy delivery. Click on the Santa Hat icon next to the promo icon to see the progress and get details on how to participate in this community-wide contest. Participants that reach their goal and the community goal will receive a new limited edition trophy item! FEATURE Added a new "actions" menu to the vault that includes a feature to sell all filtered items from your vault with a single click. This means that any item currently visible in your vault will be sold by clicking that button. So, you can sell 100% of your vault at once or pick and choose with the available filtering options. FEATURE There is a new reward for reaching the almighty level 100 other than a medal - the new Casino God Trophy item! FEATURE Added 16 new exclusive items for Party Bombs and Daily Spins (includes new poker tables, blackjack tables, golden roulette, golden solitaire and more). UPDATE If you are reading this then you are seeing the new updates display. This is now part of the GoldFire toolbar to be standardized and can be accessed at any time with the "updates" button by clicking the "i" on the toolbar (or by clicking on any TV in-game). UPDATE Updated the CasinoRPG Steam app to use the latest renderer for better performance and stability. FIX Various visual glitches and improvements to the mobile version of the game (app updates coming soon to fix several other issues). FIX Memory leak caused by dropping a large number of Party Bombs during a single play session. FIX Another visual glitch that could show a slightly incorrect sale value for vault items (the server was still giving the right amount). FIX A waypoint to an under-construction building would sometimes get stuck. FIX Upgrading to a 5-star casino would sometimes instantly show the notification that the upgrade was complete. FIX Various audio fixes on different browsers. FIX Rare error that could cause slots to get stuck. NATIONAL COOKIE DAY: A delicious holiday is coming up on Tuesday, December 4. For 24 hours only, a very limited edition item will be available for purchase (or until they sell out). We'll release a batch of 75 of the item every 2 hours throughout the day so every timezone gets a chance. These are on a first come, first serve basis with a limit of 5 per person, per batch. UPDATE Moved the game and the goldfire.me site to new servers to provide better and more predictable speed/uptime as well as the ability to scale to more players. UPDATE You can now hire a contractor for your casino while carrying party bombs. UPDATE Holiday ATMs from Easter and St. Patrick's now have their own unique Party Bomb designs like with Halloween. FIX It was possible in certain instances to visually have a bingo and not be able to claim it. FIX Prevent rare issue that could cause a crew to be pulled into a battle after canceling a challenge. FIX Party chat could sometimes get stuck after a slot tournament (let us know if this continues to happen for you). FIX Bonus spins during battles/wars didn't always add up the score correctly. FIX Bonus spins at the end of a slot sprint could cause the incorrect winner to be displayed (the correct winner was awarded correctly). FIX A rounding issue could cause the client to show a slightly different re-sale value in the editor than the real re-sale value. FIX Prevent clicking through map and setting off a party bomb. FIX Some crews were able to start a battle without 3 members "available to battle." FIX Lot prices wouldn't always show correctly on the mobile apps. FIX Panning around a casino floor on mobile would sometimes trigger a casino game or other unintended action. FIX Various fixes and improvements to new player tutorial. HALLOWEEN PROMO: The city is decked out for this spooky time of year, and we have 6 incredible limited edition Halloween items to celebrate! Get the details on how you can get yours before they are gone for good after November 9 by clicking on the pumpkin icon at the top of the game screen. TRICK-OR-TREAT 2018: When the ghosts and ghouls start roaming the streets, you know what that means! Click on the candy icon next to the promo icon to see the trick-or-treat progress and get details on how to participate in this community-wide event. Participants that reach their goal and the community goal will receive a new limited edition Trick-or-Treat 2018 Trophy item! HOTELS SURVEY: The long-awaited hotels feature is getting closer to becoming reality, but we want your input before we wrap up final planning! Click here to take just a few minutes to fill out a survey to get your ideas/feedback included. FEATURE Tired of waiting for others to join you for a round of bingo? That wait is now over as we've built bots into bingo that will play with you until other real players join to take their spots! FEATURE Items in your vault can now be directly gifted to your friends for a small postage fee! Simply go to their profile and click on the "Send Gift" option in the actions list (previously "transfer chips"). You can also still send chips through this same window. FEATURE Party Bombs can now be purchased in packs of 5 (with a wait time of 50 minutes). FEATURE Each player now has an "available for battle" toggle from their crew's battle window. Toggling this off will prevent you from being able to participate in any battles that occur while it is unchecked, but it also lowers your team's "active" count which is used to determine team size. So, if any of your crew members won't be available for a battle, you can still start a battle challenge without worrying about being at a disadvantage. FEATURE There is now the option to cancel a battle challenge for a full refund before a match has been made with another crew. FEATURE There are now descriptions for medals in both your profile window and on the list of medals accessed via the toolbar (some are still kept a secret until you unlock them). FEATURE Citizens can now click an address in a player's profile to be taken directly to that location (non-citizens will have the location added as a waypoint). FEATURE Added new medals for reaching level 125 and level 150. UPDATE All new and past Halloween limited edition ATM machines now give jack-o-lanterns as party bombs. UPDATE The default profile avatars on new accounts have been changed to use a new style that should avoid randomly generating certain unfavorable symbols. If you currently have an avatar that you'd like updated to the new style please submit a ticket. FIX The battle challenge for scratchers sometimes wasn't registering. FIX Broken items in the vault wouldn't show the correct sale value. FIX Items in the editor could sometimes appear below the floor and weren't able to be moved until reloading. PROMO ITEM VOTING: With Halloween right around the corner, we are looking for your help in selecting the best limited edition items. Click the icon to the right of your Casino Points to see the options and cast your vote. FEATURE The "battles" crew setting has been removed in favor of a simplified battle challenging system. If your crew wants to battle, you simply start a challenge and then the matching process will begin (matching you with another crew that has started a battle challenge and is pending a match). If your crew doesn't want to battle, then you don't have to do anything. UPDATE Due to the change to the battle system, selecting a bet amount no longer made sense. The buy-in for battles is now set at 50,000 chips per battle participant (paid from the crew bank). The payout still works the same as before. UPDATE The concept of battle protection has been removed since you can no longer get challenged without actively starting your own battle challenge. UPDATE Withdrawing from a battle has also been removed for the same reason. UPDATE There was often confusion with slot item unlocking, so we've updated how this is displayed in the bonus games to make it more clear. UPDATE Various server updates to improve network performance. UPDATE The "wall" filter in the vault now includes exclusive wall items. FIX The mission giver coin over the NPC's head would sometimes flicker when at the edge of the screen. FIX Going to a profile from global chat would sometimes prevent global chat from being scrollable after going back. FIX Outfits using the female white ninja outfit were broken. FIX The crew invites setting wouldn't always save correctly. FIX Various other bug fixes and errors.